Jet skis are easily the fastest and most thrilling personal water craft (PWC) available. Essentially, they’re like motorbikes that ride on open water. However, a PWC doesn’t operate in the same way as a boat, with an outboard motor and propeller; nor is it like an actual motorbike with a gasoline engine moving the back wheel. In fact, a jet ski powers through the water by shooting a forceful jet stream of water behind it and the force of the water squirting backwards pushes it forward. The key here is Newton’s third law of motion – every action has an equal and opposite reaction. So how exactly does all of this work internally? Powering Water Intake. When riders first turn the key, a standard 1500cc gasoline engine engages (the engine is about the same size that would be found in a small car or large motorbike). This power causes large amounts of water to be sucked in through an intake grate located on the bottom of the jet ski. Powering the Impeller. In cars and motorbikes, the engine drives the wheels in order to provoke motion. However, the jet ski’s engine powers an impeller, which is kind of like a propeller that’s fitted inside a pipe. The impeller is made of three stainless steel blades, about five inches in diameter. The water is sucked in through one end of the pipe and then expelled through the other end in a high-speed jet stream. Steering and Water Speed. The water exits through a steerable nozzle located in the back of the jet ski. It’s smaller in size than the water intake grate, so the force of the water being pushed out helps to build up speed for the jet stream. Steering is similar to a motorbike, or simply turning handlebars one way or another. The handlebars pull a cable that turns the water jet in the steering direction, thus enabling riders to maneuver with ease. 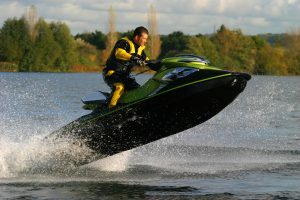 It’s important to note that since the speed of the water jet powers the jet ski, they are more effective at high speeds and are more difficult to ride at low speeds. This is the science behind how jet skis work internally to give Falls Lake jet ski riders an exciting time on the water. If you’re interested in renting a jet ski, pontoon boat, or fishing boat, give us a call at Motor Boatin today! When living and boating in the Raleigh area, there are many choices of where to rent a jet ski. These options include Jordan Lake, Falls Lake, or heading to the beach. But, no matter where a jet ski can be rented, how can you tell it is a good company to rent from? Upon first talking to a company, there are questions to ask about their company and products. Motor-Boatin regularly receives phone calls about our jet skis and pontoon boats and we are happy to answer any questions! But, also inspect the jet skis upon arrival at their site. If it seems a little fishy, then they aren’t the right company to rent from. What Insurance Coverage is Included? Motor-Boatin can only rent to individuals over the age of 26 because we offer full liability insurance when renting a boat or jet ski at Falls Lake. How Old Are the Jet Skis? Rust and corrosion on jet skis are a sign that they are older and less reliable. All jet skis should look new or remain in excellent condition; if they look older or warn down, this is not a great rental. Has the Jet Ski Been Maintained? Make sure there are no water leaks or loose wires first and foremost. Be sure the head isn’t burnt out of the jet ski. Then, discuss with the owner pump and impeller blades as well as make ask about damage to the hull of the jet ski. How to Operate the Jet Ski? A jet ski rental company should teach on how to use their specific jet skis including starting and stopping the vehicle and what to do in case of an emergency. Seen something that made you nervous before renting a jet ski in Raleigh? Motor-Boatin, which rents jet skis and boats on Falls Lake, offer great insurance, equipment, and customer service. Give us a call today at 919-800-9716 to set up a jet ski rental on Falls Lake. Summertime in Raleigh is hot! With temperatures in the mid to upper 90s, everyone is looking for a way to cool off. 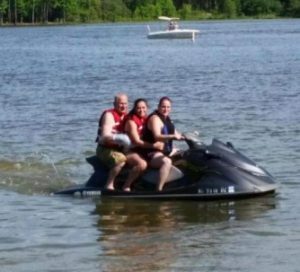 Spending a day with a set of rented jet skis is a great way to cool off in Raleigh! However, many people won’t rent jet skis or boats during the summer because they think they have to go to Jordan Lake and it is too crowded. Great news! Motor-Boatin on Falls Lake offers jet ski rentals and pontoon rentals for Falls Lake. Falls Lake is much less populated than Jordan Lake and allows for a relaxing weekend to beat the Raleigh summer heat! Many Renting Opportunities. It can get very hot very quickly and it may be too warm to spend the entire day on Falls Lake. No need to worry, we rent for half days, full days, or multiple days at a time. We Focus on Safety. We rent Yahama’s Waverunner’s jet skis which are some of the safest jet skis on the market. It is very important to us at Motor-Boatin to protect our patrons but also the general public who will be spending time at Falls Lake. Delivery Options. If a group of friends are heading to Jordan Lake or Harris Lake, but there are no jet skis left to rent, call us! We allow renters to take our Jet Skis from Falls Lake to any lake in North Carolina. Does a Saturday with jet skis or pontoon boat on the lake sound great? Contact Motor-Boatin today to reserve a jet ski or set of jet skis for this weekend before it is too late.